If there has been a theme for this week, it would be love. It started and ended for me with discussions on how to improve care and support for those in need of health and social care. And trying to capture what is the essence of creating a quality approach. Now I could talk of asset based, person-centred, responsive, flexible, respectful, partnership based but those kind of words roll of the tongue and don't always connect us with our humanity. We collect those words to get closer to that seemingly indefinable essence of what enables wellbeing and change in relationship with others. We wonder if its ok to provide comfort in the moment with a hug, to describe someone we care for in terms of friendship, to put another's needs before our own, even if we're not related because someone has told us its unprofessional. And yet we know in our own hearts that we want those who care for and support us to meet us as people, as equals and not hidden behind the shield of a title or indeed a uniform. But as themselves in all their imperfections and in that moment of contact willing to meet us as people, not conditions, not problems but in all of our humanity. As I have explored what enables that in so much of my work this week, I have come to believe that it's about releasing people's capacity to love, in all of its senses. Of course love exists not only between individuals or in families but in communities too. I saw it today as people carried bags of groceries down the Royal Mile in Edinburgh ( the tourists must have wondered what was happening!) to collect and disseminate to local food banks. Oh how I wish I didn't live in a country where wealth is so poorly distributed we need food banks to correct the balance. But I'm glad nonetheless to see so many show care for others in communities all over the country. That gives me hope for better things. So what's love go to do with it? Just about everything I think, don't you? A new life at its term? 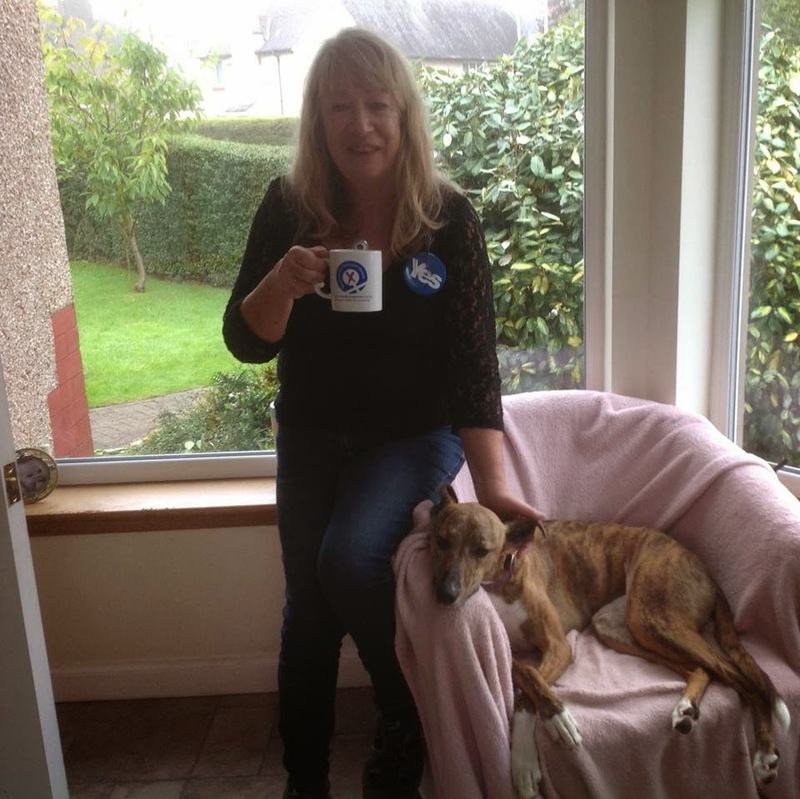 Proudly holding my Women for Independence Mug and stroking Cara. What a few days this has been in my homeland. As most of you will know, I supported Yes for a chance to create a better form of social justice in our land, in particular one that ensured every voice counted. Well time will tell what the promise of new powers will deliver and if that will ensure we can build a more just and equal society. But we have shone a light on democracy and illustrated that social movements can emerge and create change. Recently a friend said that social movements rarely create the thing they set out to do but they do create change. Let's hope so. I have loved being part of this social movement and I will continue to do all I can for more socially just, equal and importantly to me, heartful community in all my life and work. I'm especially fortunate to have the opportunity to do that. It's been an honour to meet so many passionate people dedicated to improving things for everyone. It gives me such hope for the future. I was one of the 45% as the movement is describing itself, but I feel no need to define myself as that. I would rather work into the future, for the wellbeing of all in our communities and our nation, however they want to define that. For now I will dry my tears and plan how I can align all my life and work to work toward what I believe in. I will keep you posted! Thanks so much to all of you in Scotland who have got us to this next step, the work continues, there is so much to be proud of and I'm so honoured to have been part of the journey. I leave you with the very wonderful Seamus Heaney. A friend reminded me of his quote about poetry and music being food for the soul. As poetry, music and song have been a key part of this very wonderful social movement, this feels right. Recently I had a reunion with my fellow nursing students from the University of Edinburgh. It was a fabulous weekend connecting with people who were such an important part of my life at one stage. Some have stayed in it of course but how special it was to meet again and look back at our younger selves as so many memories were awakened. How did we feel the course had affected our lives, we wondered? I recalled that a former student had told us, the degree in nursing gave her skills for life. I remember thinking with a youthful arrogance, really, is that all?Of course it was nt all but now I know what a fundamental gift that was. Our Professor was the unique Professor Annie Altschul. She was a mental health nurse by background, an Austrian who had left her homeland when fascism was plowing its devastating furrow. Her special research interest was the therapeutic relationship. We recalled her words to us: that the best tool we had as nurses, was ourselves. An overwhelming thought when you are a raw 18 year old, but now I recognise the deep wisdom she spoke. Not only are we older, greyer and our lives have had some unpredicted twists and turns but the world we work in too is different. The people we care for now have complex illness, they tend to be older and usually have more than one condition to deal with. In some respects that is a success story as we live longer now, but the reality too is that we live longer with long term conditions. Its hard to hear this spoken of in healthcare without words like burden and wait for it; multimorbidity being used. I have been known to introduce myself at such events, as Audrey a walking multi morbidity! Yes it's a joke but its also my way of reminding us that we are people, not burdens, not the blame for pressure on the health system, we are the reason the system exists. I absolutely understand the challenge of caring for people with complex conditions, the primary care system is buckling with that pressure. But we know our medical and nursing education does not currently prepare people for the reality they face. Undoubtedly we need to change our approach to a person centred one, with people not conditions or systems of the body the focus. An assets based approach where we help people discover their resources to enable their own wellbeing, whatever their health issues. Where we focus on fostering self belief and self management, enabled, not disabled, by our health and care needs. Where health and care workers recognise their role is to enable wellbeing not merely to treat disease or support people safely. And they too as staff are valued, supported and stimulated in their work. A culture that starts with "what matters to you?" is the one which will create the conditions for wellbeing in our selves and our communities. The young nurses setting out on their journey as I did so many years ago, will see a health system very different to the one I did. In very many ways it will be better but also wakening up to the fact it needs to change. We need to respond to that call and give those professionals the right tools and conditions to do that. Language is so important so let's stop talking burden and start talking assets, it will start to turn the wheel in the right direction and give us all the starting point for change. I'm working with a great organisation who have embraced the future with a very personalised form of support. I spent time with the manager, who told me, "since I started this project, I haven't worked a day". A team who love their work because they see the difference it makes. Now that's a great starting point too.